The Raving Queen: Happy Birthday, Meryl!!!!!!!!!!!!!!!!!!! This is quite a day, darlings! Not only is it, as far as I am concerned, the longest day of the year, and the day of the Annual Mermaid Parade in Brooklyn, not to mention the 44th Anniversary of the Death Of Judy Garland, but it is something to shout in the streets about! Today, girls, is the birthday of that Divinity known to us all, simply as Meryl Streep!!!!!!!!!! Or, MERYL, to my girls!!!!!!!!!!!!!!!!!!! And not just any birthday, for, today, MERYL reaches the age of 64!!!!!!!!!! Which has always been a cryptic number to me. There was the Lennon-McCartney song "When I'm 64," featured on their masterpiece, "Sgt. Pepper," but 64 has sad connotations for me because, back in 1979, that was precisely the age my mother passed away. And, of course, being REALLY 24 at the time, (instead of professionally, as I am now!!!!!!!!!!) to me, 64 seemed so....well..old!!!!!!!!! But now, at 58, with 60 practically staring me in the face, not only does it seem not so old, it seems like Time has just flown. 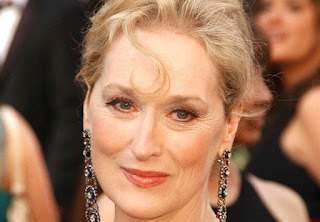 Girls, I am telling you, no one can popularize this age, or look so good at it, as MERYL!!!!!!!!!!!! Now, one-two-three--HAPPY BIRTHDAY, MERYL!!!!!!!!!! !--there is her birthday wish from the Raving Queen and all my girls!!!!!!!!!!!!!!!!!!! Wonder how MERYL will celebrate? With family and friends, of course! I would guess Stanley Tucci and his family, which now includes Emily Blunt, as he is now married to Emily's sister, will all convene at MERYL'S today, and Stanley will take over that kitchen, and whip up a birthday dinner and dessert the likes of which I am sure we would all like to see! I mean, MERYL deserves the BEST, and let's wish it for her! And don't you just know, darlings, talk will revolve around the already much discussed film version of "Revenge Wears Prada?????" Wish I could be a fly on the wall, at that house, darlings!!!!!!!!!!!!!!!!! Happy Birthday MERYL!!!!!!!!!! You take 64 to a new level!!!!!!!!!!!!!!!!!!!!!!!!!!!!!!!! !